We’ve long argued (and proven empirically) that there is a strong correlation between improving ROIC and increasing shareholder value. Nevertheless, the majority of mutual fund managers continue to pick stocks based on flawed metrics such as price-to-earnings ratios, return on equity, or accounting book value. We recommend avoiding funds with managers who consider accounting earnings as representative of “fundamentals”. Instead, look for managers that not only talk about cash flows and return on invested capital (ROIC), but use them in their investment process. We analyze these metrics for all the holdings of over 7,500 U.S. ETFs and mutual funds daily to identify which fund managers put their analytical money where their mouth is. Occasionally, we come across a fund whose managers diligently leverage ROIC in their investment strategy. 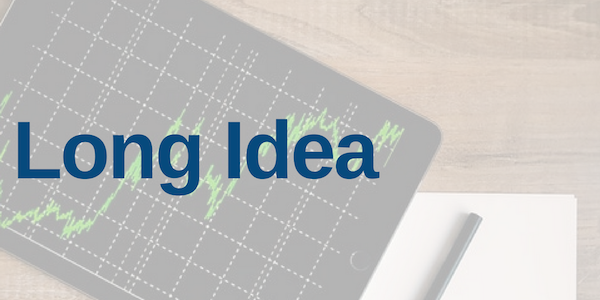 This week we are featuring one such fund, the MainStay Epoch U.S. Small Cap Fund (MOPRX), as this week’s Long Idea. MOPRX has underperformed its benchmark, the iShares Russell 2000 ETF (IWM), in recent years, which helps explain its 2-Star and 3-Star ratings (depending upon share class) from Morningstar. 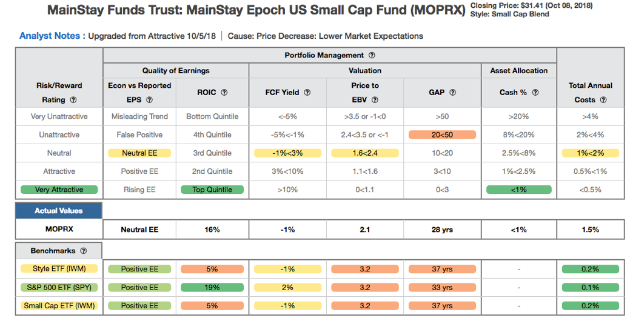 Until recently, MOPRX has also received an Unattractive or Neutral rating when viewed through our Predictive Risk/Reward Fund Rating methodology, which analyzes all the holdings of the fund as well as it costs. As the fund has allocated more to higher rated stocks, the fund has grown more attractive. However, backward looking fund research cannot identify such a change, as evidenced by the disconnect in ratings in Figure 1. In late September, MOPRX was upgraded to an Attractive rating, and then upgraded again to a Very Attractive rating on October 5, 2018. Higher quality holdings and below average costs mean MOPRX is more likely to outperform moving forward, something traditional fund research can’t tell you. “The key to understanding a company requires a focus on the cash generation drivers of the business, not a focus on accounting terms like earnings or book value. This investment philosophy, along with a process that assesses the quality of earnings, helps Epoch, and MOPRX, pick higher quality stocks and avoid riskier stocks compared to its peers. 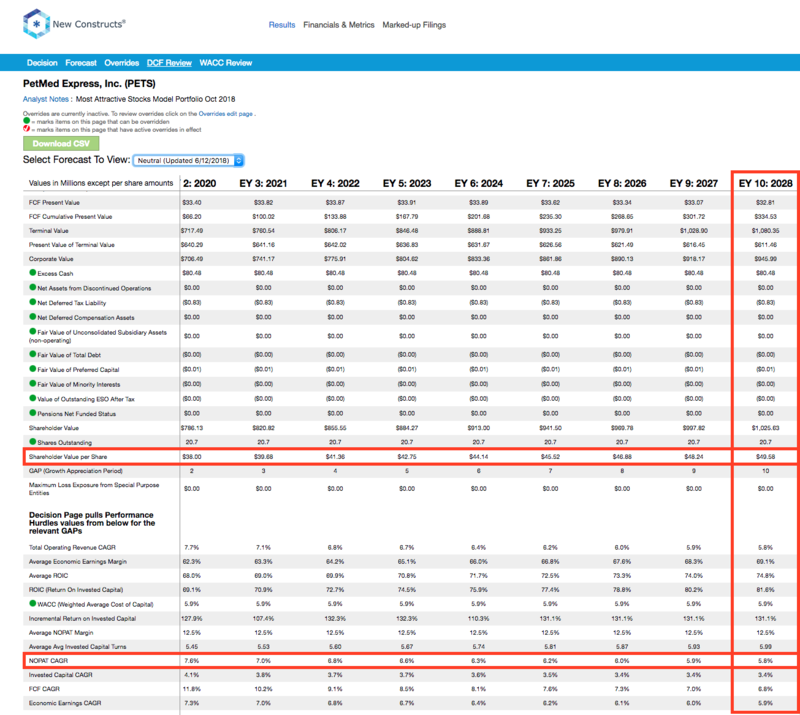 Figure 2 shows that MOPRX allocates a higher percentage of its assets to Attractive-or-better rated stocks and a lower percentage to Unattractive-or-worse rated stocks than its benchmark, the iShares Russell 2000 ETF (IWM). Per Figure 2, MOPRX allocates 16% of its assets to Attractive-or-better rated stocks compared to just 9% for IWM. On the flip side, MOPRX allocates 31% of its assets to Unattractive-or-worse rated stocks compared to 44% for IWM. Given this favorable allocation relative to the benchmark, MainStay Epoch U.S. Small Cap Fund appears well positioned to capture more upside with lower risk. Compared to the average mutual fund, MOPRX has a much better chance of generating the outperformance required to justify its fees. With a focus on ROIC and cash generation, one would expect MOPRX’s managers to excel at finding higher-quality companies (as measured by ROIC) with lower-risk valuation. Per Figure 3, they do just that. Figure 3 contains our detailed rating for MOPRX, which includes each of the criteria we use to rate all funds under coverage. These criteria are the same for our Stock Rating Methodology, because the performance of a fund’s holdings equals the performance of a fund after fees. The return on invested capital (ROIC) for MOPRX’s holdings is 16%, more than three times higher than the 5% ROIC earned by companies held by IWM. The price to economic book value (PEBV) ratio for MOPRX is 2.1, while the PEBV ratio for IWM is 3.2. Our discounted cash flow analysis reveals an average market implied growth appreciation period (GAP) of 28 years for MOPRX holdings compared to 37 years for IWM. Ultimately, the stocks held by MOPRX generate superior cash flows compared to IWM, yet the market projects IWM stocks to grow profits by a larger amount and for a longer period of time. We can see how MOPRX’s methodology leads it to pick high-quality stocks by looking at one of its holdings, PetMed Express (PETS: $30/share), which accounts for just over 1% of its portfolio. PETS meets many of the criteria that drive MOPRX’s investment decisions. Its 78% ROIC (up from 39% in 2014) puts it in the top quintile of all 2,800+ companies under our coverage. Over the past five years, it has generated $105 million (17% of market cap) in free cash flow and currently earns a 6% FCF yield. At its current price of $30/share, PETS has a price-to-economic book value (PEBV) ratio of 0.9. This ratio means the market expects PETS’ NOPAT to permanently decline by 10%. This expectation seems overly pessimistic for a firm that has grown NOPAT by 15% compounded annually over the past five years and 7% compounded annually over the last decade. If PETS can maintain TTM NOPAT margins of 13% and grow NOPAT by just 6% compounded annually for the next decade, the stock is worth $49/share today – a 65% upside. See the math behind this dynamic DCF scenario here. By utilizing ROIC as part of its methodology and focusing on cash generation, not accounting earnings, MOPRX is able to identify highly profitable companies trading at large discounts to their fair value, such as PETS. Not only does MOPRX offer high-quality stock selection, it does so at a reasonable price. The fund’s total annual costs of 1.51% make it cheaper than 54% of the 844 Small Cap Blend mutual funds that we cover. Its costs are also below the Small Cap Blend mutual fund average of 1.74% but above the asset-weighted average of 0.95%. While it is easy to pick a 5-Star rated fund from Morningstar, research shows such a strategy has risks and does not necessarily lead to outperformance. Smart fund investing means analyzing the holdings of each fund. Unfortunately, most investors do not realize they can get high-quality research on fund holdings and are content with investing based on past performance. Our Robo-Analyst technology analyzes the holdings of all 892 ETFs and mutual funds in the Small Cap Blend style. The number of holdings in these ETFs and mutual funds varies from just 23 stocks to 3,266 stocks in a given fund. Our diligence on fund holdings allows us to find mutual funds, like MOPRX, with a portfolio that suggests future performance will be strong. This article originally published on October 12, 2018.